You’re hearing a lot of explanations as to what’s going on with the stock market. Here’s an explanation you won’t find in the mainstream – and it’s one of the most useful of all. The stock market’s volatility from late July through early October was extraordinarily low. For 50 straight days the S&P 500 had not closed more than 0.8% in either direction, the longest such streak since 1968. Yet, on October 3, all that changed. The markets dropped hard… and the VIX suddenly spiked even harder. The sudden explosion in volatility blindsided almost everyone – investors, media talking heads, economists and market watchers alike. Volatility is a great disruptor, but not in a Silicon Valley sense. Instead, think: bull in a China shop. Could anything have foreseen this sudden reversal? Most investors, and even pros, don’t realize it: YES! Large Speculators are making their largest bet in nearly a year that market volatility will remain subdued. Last week, this cohort of speculators increased their net-short position in VIX futures to 140,444 contracts, the largest bet on a low VIX since November 2017. … Large Specs often make their biggest bets near trend reversals, catching them in wrong-way bets at the wrong time. Large Specs and other “big boys” tend to make “wrong-way bets at the wrong time.” That propensity was again on display just two days after the forecast you see above — on Oct. 10, when the DJIA closed more than 800 points lower. That was the index’s worst day in eight months, and the worst whipping for technology shares in seven years. Moreover, the volatility continued the very next day, with the DJIA closing down another 545 points. Of course, volatility implies moves in both directions. By Oct. 16, the DJIA closed up more than 500 points, only to surrender more than 300 points on Oct. 18. Then came other triple-digit declines on Oct. 22-23. 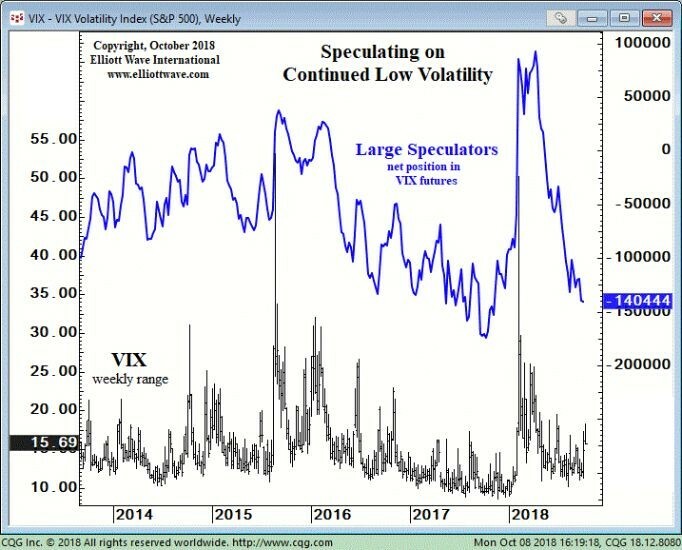 The bottom line is that watching large speculators (and other sentiment metrics) can prepare you to take advantage of volatility rather than being blindsided by it. If you are an investor who wants to be ready for volatility, download the 5 Tells a Market May Be About to Reverse report here, instantly. It’s 100% free! This article was syndicated by Elliott Wave International and was originally published under the headline Watch This Indicator if You Want to Get Tipped Off to Approaching Volatility. EWI is the world’s largest market forecasting firm. Its staff of full-time analysts led by Chartered Market Technician Robert Prechter provides 24-hour-a-day market analysis to institutional and private investors around the world. Non Repainting Supertrend Indicator – Metatrader 4 Now you can download Non Repainting Super trend indicator with Buy and Sell Arrows for MT4 platform. Initial version of Trading system is available free for public download in Metatrader 4 platform.